When aspiring violinists want to learn how to play the violin, they have to learn how to choose a violin that suits their needs, so that they can play it well. Choosing a violin can be a difficult task for anyone starting new, and hence many would prefer to look for advice from professional violinists or violin shop owners. It is great to have an experienced violin player to choose a violin for you, but it would also be better if we know how to choose a violin ourselves as we progress on. Below is a guide on showing the criteria to choosing a suitable violin for your playing. Below are six criteria you might like to know when you choose a violin. Criteria are ranked in the level of importance, so you should at least know what to look out for first. We would rank the purpose of choosing a violin as the first. Before you buy a violin, you have to know what are you buying the violin for, and why are you buying it. Are you buying the violin as a prized collection like antique violins? Are you buying it for leisure playing, and probably add to your collection of musical instruments at home? Are you buying it to further your skills in violin playing, and also for frequent stage performances? When you choose a violin with a purpose, you will also determine the budget you have set aside, and the strict criteria you have set before you buy the violin. Hence, you will likely to invest more in a violin which you will use it for stage performance, compared to a violin for leisure playing. Secondly, we will look at the size. This is a relatively quick process when we choose a violin. The violin with the right size will allow the violinist to handle the violin well. 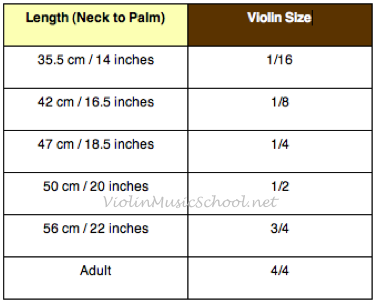 To determine to size of the violin one should get, we measure the length from the student’s neck to palm of their extended left hand. This method would be useful when buying kids’ violins, where sizes varies across ages. The tone of the violin is an important criteria when we choose a violin, and it is also where most violinist based their decisions on. Different violins produce different types of tones. For example, a Guarneri-make violin would present a dark and deep tone while a Stradivarius-make violin would present a bright and direct tone. While you may not get the original antique violins made by the two legendary violin makers, you could get violin replicas which matched closely the quality of tone projected by original violins. While checking the tone, the volume do make a difference while choosing a violin. Violinists would love a violin that is able to project its volume, especially when they are soloists for performance. However, the volume of the violin could be adjusted with the help of a professional. A change in violin strings, or shifting of the violin bridge would do the job, even for a weak sounding violin. We love things that look nice. Hence, when we choose a violin, we would always want a violin that is in perfect condition (no scratch marks or damages), a colour that we love, and probably match our personality too. However, do not choose a violin just by looking at its appearance (unless its just for displaying purposes). Appearance do play a part, but do focus more on the internal beauty of the violin, in the sound and tone it produced. The condition of the violin is important, especially in buying old violins, or violins which has been handled multiple times before. You have to check if there’s any cracks or damages in the violin. A violin which has cracks, especially on its body, will not sound as good as its original one. Most violins which have exchanged hands several times would have been serviced multiple times too. With that, do check how many times the violin has been serviced, and for what specific reasons. You do not want to be the receiving end of a violin which has to be repaired more than it’s played. Some violinist argue that age do makes a big difference in how a violin will sound, in a sense that the older the violin, the better it will sound. It is correct to some extent, and that’s probably why most famous violins chose to perform with antique violins, which are over hundreds of years old. However, a new violin may also sound better than an old violin. However, what new violins lack, is the resonance which is only possible due to age of the wood in old violins. Hence, does age matter? Yes, but it would probably be the last criteria to judge when we choose a violin. Bring it up to test play the violin, be it you are in a violin shop or from your friend. When you play it, observe its tone and volume produced. If possible, test it at different surroundings, especially at places where sound acoustics are weak. Doing this, you want to listen to the real sound of the violin. You could also find out more by asking the maker about the history of the violin, the make and model which the violin has, and also about the special qualities this violin possess. Again, how strict the selection process of a violin will be determined by the purpose of buying it. After You Choose A Violin… Where To Buy? Now it comes to buying the violin! While you can buy it anywhere, it would be advisable to buy the violin from a violin shop, which specialize in all things violin, than a music shop, which sells a general range of musical instruments and accessories. A violin shop will have a wider range of violins, and usually have a professional or expert to help you choose a violin you want. How About Online Violin Shopping? Unlike other violin accessories, we would much prefer violinists to have a touch and feel of the violin before they purchase it. As mentioned above, you would want to test play the violin, on the tone and volume produced, instead of just looking at the colour and design of the violin. When you choose a violin online, you can only certify certain qualities, such as the make and model, the size, the colour, the appearance, the condition and the age. For the tone and volume, you would have to hear it yourself, as it is subjected to personal preference. However, that doesn’t mean that you cannot buy violins online. Reputable online stores have made process of choosing and buying violins online easy these days, with reviews and videos to showcase every quality of the violin. Some do even provide free shipment back to the store if it doesn’t feel well on you when you first played it. Check out our Violin Music Shop to have a feel of shopping for violins online! So you have now chosen a violin. Next, learn how to take good care of your precious violin!